The Toyota C-HR has enjoyed strong success since its launch at the end of 2016. It was the company’s entry into the mid-size crossover market and made an immediate impact with its striking styling and rewarding driving character, founded on its Toyota New Global Architecture-based (TNGA) platform. The availability of Toyota’s latest-generation hybrid powertrain has also proved highly popular with customers, commanding the majority of European sales (more than 75 per cent). The production model has provided the inspiration for Toyota designers to explore the possibilities for a higher-powered hybrid version, with an even more impactful and emotional styling treatment. 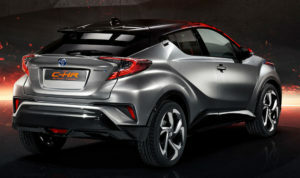 The result is the new Toyota C-HR Hy-Power Concept, created by a team at ED2, Toyota’s European design studio in the South of France and making its world debut at the 2017 Frankfurt motor show. 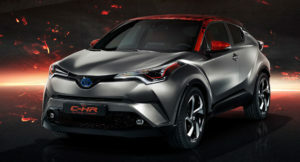 Toyota’s intention was to develop the styling of the Toyota C-HR to produce a very desirable vehicle that connects even more strongly with customers who have highly individual tastes and lifestyles, emphasising its stylishness and fun-to-drive character. Further exploring the “diamond” architectural theme of the production model, the new concept displays a high-quality execution and attention to detail throughout. The design also reflects the presence of a more powerful hybrid powertrain, heralding a future expansion of Toyota’s hybrid programme. From the start of the Toyota C-HR Hy-Power Concept project the design team knew that they did not want to use heavy customisation or “bolted-on” elements to achieve the impact they were looking for. Instead, their skills were applied to amplifying the inherent qualities of the production car’s design through innovative use of colours, finishes and detailing. In fact, the concept uses exactly the same sheet metal as the showroom car. Exploring the diamond theme that underpins the Toyota C-HR’s styling more deeply, the team at ED2 found inspiration in the natural forces that turn carbon into diamonds and the way in which solid rock can conceal a fiery, molten core. This thinking led to the use of a new Dark Carbon silver paint with a matt finish to accentuate the interplay between the vehicle’s sharp lines and deeply sculpted surfaces. The effect is heightened by the use of gloss black elements, including the lower front lip spoiler, the area above the Toyota emblem on the front of the car and the wheel arch trims. Dark chrome sustains this effect, witnessed in the headlamp ornamentation, window frames and in the 20-inch alloy wheels. A dramatic contrast is struck by dazzling use of an anodised Burning Orange finish on the front pillars, the door mirror housings and an accent bar within the headlamp units. The colour is also used as a highlight within the black diamond mesh pattern of the lower grille. The use of colour, texture and form combine to even greater effect on the concept car’s roof. A unique, “diamond-cut” film covers the entire surface in a faceted, crystalline pattern that flows from darkest black at the rear to brilliant anodised orange at the front, mixing together contrasting matt and gloss planes. The interior carries forward the exterior themes to sustain the power of the concept’s design with a tone-on-tone approach that combines black upholstery and trim with Burning Orange details. The highly supportive seats are finished in black leather with orange headrests and bolsters. Burning Orange yarn has been used to create a unique, asymmetrical quilting pattern of multiple diamond shapes across the seatbacks and cushions. The design is replicated on the inner door panels, which also feature orange arm rests. A further flourish is provided by the orange finish for the highlight trim that extends the full width of the instrument panel and frames the Toyota Touch 2 multimedia touchscreen. The concept has been designed around the use of a new hybrid powertrain that offers more power and performance than the 120bhp system featured in the current production Toyota C-HR. This reflects a significant and strategic future development of Toyota’s world-leading technology that will see higher performance hybrid options being made available in all its core models. More details regarding this expansion of hybrid will be revealed early next year.